Add a splash of color and a festive feel to the outside of your home during the holiday season with Christmas lights. If you have bushes in your yard, make them come aglow by stringing lights throughout them. Create a subtle look with strings of mini white lights or use strings of large, multicolored lights for a more vibrant display. Decide what style and color lights you want to string through the bushes -- large or mini, multicolored or single-colored. Blinking or chasing lights are other options to consider. When purchasing your lights, make sure to purchase lights that can be used outdoors. Plug in your lights before wrapping them through the bushes. Not only will this tell you if the lights are working, but it will also give you an idea of how the bushes will look while you are wrapping them. Begin stringing the lights at the bottom of the bush. If you want to light the front and back of the bush, wrap the lights around the bush in a spiral formation, moving from the back to the front and wrapping the lights upward as you go. If you are only going to light the front of the bush, place the lights at the bottom of the bush and string them up and down along the front of the bush, forming a wave pattern. 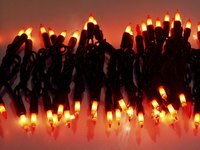 If necessary, plug more strands of lights into the previous strands of lights. Cover all plugs and sockets with electrical tape. This will prevent precipitation from collecting on the plugs and in the sockets, eliminating the risk of electrical shortages or fire.